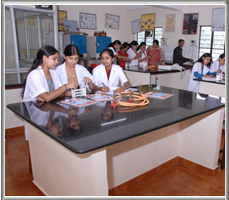 MMK And SDM Mahila Maha Vidyalaya, Mysore, is a pioneering college in the field of women’s education and empowerment. 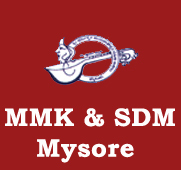 Established in the year 1990 by Mysore Makkala Koota(R) Mysore, the college was subsequently handed over to Shri Dharmasthala Manjunatheshwara Educational society (R), Ujire, Dakshina Kannada District, Karnataka, India. 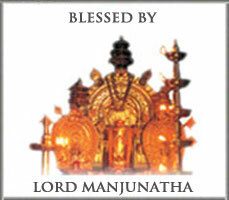 The name Shri Dharmasthala Manjunatheshwara casts a spiritual hallow all around. 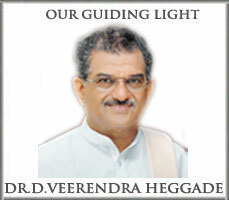 Also, our President Padmabhushan Poojya Dr.D.Veerendra Heggade’s name instantly brings in a stamp of integrity and quality. The emblem has the face of a woman and a Veena with an inscription of the quote “Nahi Jnanena Sadrusham” inside it. The face of the woman symbolizes the women empowered with quality education and excellent culture. The inscription “Nahi Jnanena Sadrusham” elevates the quote“ Knowledge is unmatched “. Veena, the divine instrument of Godess Saraswathi signifies the spread of knowledge with a touch of melody. The Ring in the logo depicts the women’s empowerment in a safe and supportive environment. Thus the emblem in essence symbolizes the vision and mission of the college. Empowerment of women to build enlightened society. Providing access for equitable and affordable education. 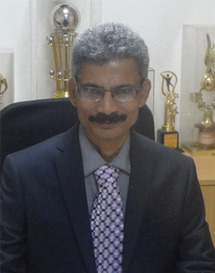 Adopting student- oriented approach through supportive environment. Imparting effective teaching, learning and evaluation through ICT. Equipping to respond to the ever-changing needs and demands of the society. Infusing research inclination, nurturing scientific temper and outlook. Extracting inert potentials through holistic approach. Focusing on continuous strengthening through comprehensive feedback. Inculcating moral values for sound conscience.